California-based champion Game Winner and the once-beaten standout Instagrand finally square off in a long-awaited matchup in Saturday’s $1 million Santa Anita Derby (GI), the West Coast’s major prep for the Kentucky Derby (GI) in four weeks. 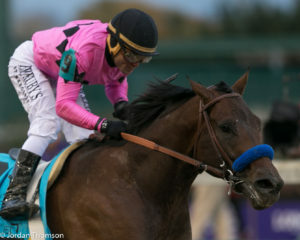 Hall of Famer Bob Baffert, who has won a record eight Santa Anita Derbies, will tighten the girth on Game Winner, as well as stakes-placed Roadster, while fellow Hall of Fame member Jerry Hollendorfer will send out Instagrand and his lesser-known stablemate, More Ice. Two other runners make up the field for the nine-furlong main track test. Since it’s inception in 1935, eleven Santa Anita Derby winners have gone on to wear the roses in Louisville, including Triple Crown winners Affirmed in 1978 and Justify a year ago, while another 15 Santa Anita Derby runners also wore the garland of roses in Louisville on the first Saturday in May. Other Santa Anita-Kentucky Derby winners are the filly Winning Colors in 1988, California Chrome, I’ll Have Another, Sunday Silence, Majestic Prince, Lucky Debonair, Swaps, Determine and Hill Gail. The race offers Road to the Derby points to the top four finishers on a 100-40-20-10 scale so a win for a couple is a must, while a placing should be sufficient to secure a spot for the reigning juvenile champion. Gary and Mary West’s Breeders’ Cup Juvenile (GI) winner and Eclipse Award-winning 2-year-old Game Winner was a nose shy of remaining undefeated when second to Omaha Beach in a division of the Rebel Stakes (GII) at Oaklawn Park last month, a race he had to run in to stay close to on his Derby path after the cancellation of the San Felipe Stakes (GII) due to the track problems at his home base of Santa Anita. The son of Candy Ride won the American Pharoah Stakes (GI) in his only Santa Anita start, but makes his first start at this nine-furlong distance, though his pedigree suggests he should have little issue with the stretchout. He’s already earned 45 Road to the Derby points, which is probably enough to get in, but a win will make him the leader by far and a sure thing to garner a place in the Derby starting gate. Regular jockey Joel Rosario is back aboard. 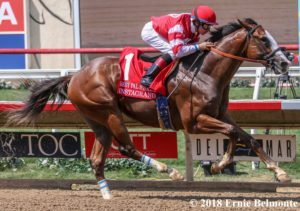 Instagrand Wins the 2018 Best Pal Stakes at Del Mar. Photo: Ernie Belmonte Jr.
OXO Equine’s Instagrand was California’s best early Derby hopeful last summer when he won his first two races by 10 lengths each, including the Best Pal Stakes (GII) at Del Mar. Deciding not to push to the Breeders’ Cup, owner Larry Best chose to stop on the $1.2 million son of Into Mischief so to have a fresh horse for the Kentucky Derby trail, but as another one affected by the weather and Santa Anita’s track situation, he headed to Aqueduct and the Gotham Stakes (GIII) last month, where he earned a bit of a troubled third-place finish. He’s been training great at Los Alamitos for a few weeks and if he goes off anywhere near his 3-1 odds will be great value under new jockey Flavien Prat. Speedway Stables’ handsome gray Roadster is Baffert’s other runner here and returns to stakes company after a nice allowance win, which came after he got a rest following his third-place finish at 4-5 in the Del Mar Futurity (GI) last summer. The son of Quality Road, who will lead the field to post under jockey Mike Smith, has looked tremendous while training despite the drama surrounding the surface beneath him, and he’s super consistent, posting mid-90 BRISnet speed figures in all three starts. He has no Derby points yet, but his connections are certainly hoping this is the spot he’ll earn enough to make the Derby gate. Nolo Contesto, who is owned by Hronis Racing and is trained by John Sadler, makes his stakes debut off a second to Roadster in allowance company last out. The maiden-winning son of the recently deceased stallion Pioneerof the Nile is an improving sort and bred to like this added distance. Jockey Joe Talamo, who won this race for Sadler in 2010 aboard Sidney’s Candy, has accepted the call here, taking over for Rosario who sticks with his champion mount. 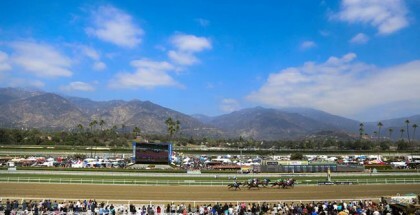 More Ice takes a giant leap up in class for Hollendorfer and Synthesis is still a maiden.